The monitor lizard is a family of large reptiles that live around the world, from asian to Africa. A native of jungles, the monitor lizard varies widly in size depending on the type, but can grow extermely large and are versatile and adaptive reptiles. Worthy of being classed as a giant reptile, the monitor lizard is often an apex predator. The Latin family name for the monitor lizard group of reptiles is Varanus genus which is the parent group, but the monitor lizard comes in a variety of styles breeds and classes below this parent classifier. In total there are thought to be over seventy species of monitor lizards which include varients like the Bengal Monitor, the Crocodile Monitor and the Water Monitor. Predominanly meat eaters, or carniverious, the monitor lizard is a natural predator, and lies typically high up on the food chain, specific varients like the Komodo dragon and the Nile Monitor are so big they are considered to be Apex predators, which marks them out as having little of no natural predators that they have to be concerned about in their respective environment. 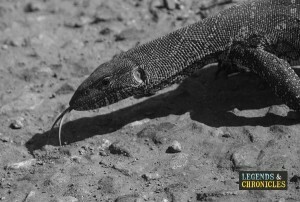 monitor lizards love their food, and have good appetites and high metabolisms which allow them to stay active. The monitor lizard is a strong and powerful reptile, with a long body, an elongated neck and a tail that makes up a large portion of their overall size. Due to the large variation in the species that covers over seventy different classes of monitor lizard, they often vary in size and appearance from the brightly coloured Blue-spotted Tree Monitor to the green and yellow patterened Nile Monitor. The monitor lizard has strong limbs and claws which they use to attack and fight their prey. Each of the monitor’s claw are sharp and powerful, capable of grabbing and ripping into its prey’s flesh. On of the most dangerous weapons the monitor lizard posesses is its tail. The Monitors tail is full of muscle and is wide, long and capable of causing serious damage. The monitor will whip the tail at a foe or prey when needed, and it can break bones, open up skin, reptile armour and flesh. The monitor lizard genus is quite large, the Genus Varanus which is the genus of the monitor lizard comprises many subgenus species, lik the Empagusia, the Eupreplosaurus and the Soterosaurus among many others. It it though that there are up to seventy different varients of monitor lizard worldwide. Due to their varied nature and subgenus varients, the monitor lizard colouring varies widly, as we mentioned before. As with nearly all giant reptiles, their skin colouring and patterning is based on their environment, their camoflauge helps then survive, hunt and be at one with their habitat. monitor lizards give birth like most reptiles through oviparity, which means the mother monitor lizard lays eggs with little development inside their parent. The fertilisation process as with most other land dwellers occurs before the eggs are layed, and typically the mother will lay anything from five to thirty eggs. Once the monitor lizard baby emerges from its shell, it grows extremely rapidly. Most of their growth occurs in the first year, and in this stage it’s critical the Monitor receives sufficient food and heat to ensure they growth to their individual potential. After the rapid initial growth cycle, monitor lizards typically keep growing at a slowed rate for the next six months, and then they still continue to grow over time, but at a much reduced rate. How old does a monitor lizard get? There is a lot of debate over the age that monitor lizards live too, its well documented of certain species reaching over twenty years in captivitiy, and of course in the wild this is affected by many external factors but monitor lizards can live much longer and there have been numerous reportings of monitor lizards living over twenty years old. The monitor lizard is one of the worlds biggest reptiles, which is why we have included it in our Giant Reptiles section. The biggest monitor lizard is the Komodo dragon, which we also talk about in more detail too, both the Crocodile Monitor, the Nile Monitor and the Water Monitor are also other big monitor lizard variants. While it’s wholly possible for large monitor lizard to reach up to eight foot and bigger, there have been many reports of much larger monitor lizards being sighted. While the Komodo dragon is commonly regarded to be the largest monitor lizard, other large monitors have been found in the wild. A large Asian water monitor was found at a size of five feet four inches long, making it among the bigger sizes found for this class. It’s quite common for the bigger monitor lizard classes to reach sizes of up to six feet. The monitor lizard is a mostly carniverous reptile, they eat a variety of insects and small invertebrates, they also eat fish, small reptiles, and even have been known to consume small mammels. It has been known for the monitor lizard to eat fruit or local vegetation, but most commonly they will stick to a mostly meat based diet. Where are monitor lizards from? Monitor lizards are thougth to have orginated in northern Asia, and were thought to have been around at the end of the dinasour*add term periods. Early example of monitor has been founds much further afield though in what is now North America. Species and varients has also been found in Austrialia and in Europe. 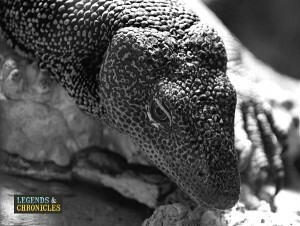 Due to their natural need for a warm environment, its common now to only find monitor lizards in suitable warm climate. You can currently find members of the monitor lizard family living in Australasian, Asia and Africa. The monitor lizard is truly one of the great giant reptiles. A strong, powerful lizard with dangerous claws and a deadly tail, the monitor is a natural predator, and in many cases an apex predator in its natural habitat. This intruiging reptile comes in a variety of types and can live to ripe old ages and grow to a truly giant size. It’s no wonder the monitor lizard is one of the most well known giant reptiles currently living on planet Earth.